What Sets a German Car Apart From Japanese Autos? There’s an everlasting debate surrounding the quality of German-made cars and Japanese-produced automobiles. While both will surely get you from point A to point B, there are several notable differences. For instance, if you own a German-manufactured vehicle, you’ll likely have to take it to a different mechanic to get repairs or maintenance, simply because the parts underneath the hood are completely different than those that you’d find in a Japanese machine. That said, there are also a few similarities between German and Japanese Let’s take a look at the similarities and differences between German-made cars and Japanese-produced autos. Both German and Japanese vehicles are notoriously consistent, replicated, and precise. German and Japanese auto manufacturers employ tried and true techniques to build their vehicles. While renovation is a constant, the growing vehicle catalog presented by both German and Japanese manufacturers doesn’t change too often. You can expect new adaptations and minor improvements on vehicle models that sell year after year. Instead of unveiling brand new makes and models, both German and Japanese producers often build out vehicles in series, releasing a new model every year. 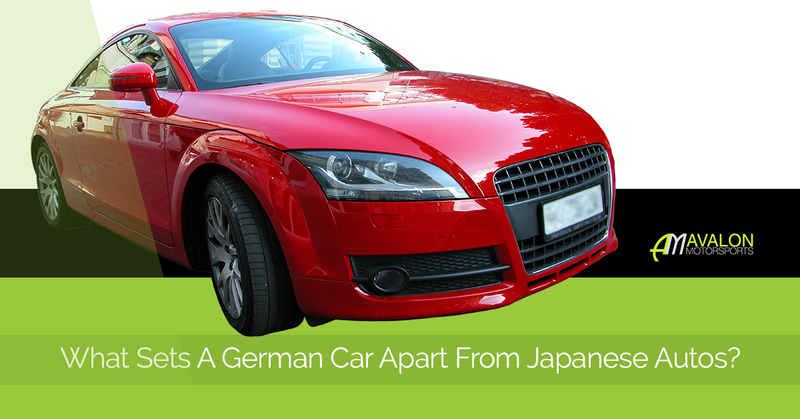 On top of consistency, both German and Japanese vehicle manufacturers have mastered the art of replication. While these manufacturers may not have invented the assembly line, they’ve certainly perfected it. Designing cars that can be replicated ensures that costs stay low, while precision and consistency remain high—so, consumers know what to expect when purchasing various German and Japanese models. Precise engineering aids the quality and durability of a vehicle. Both German and Japanese automobile producers place great weight in precision engineering, and that’s valuable to consumers. Japanese manufacturers target the volume market; these producers strive to build vehicles as quickly as possible, with components that are cheaper. Thus, Japanese produced cars are more affordable; however, while they are less expensive, these vehicles (especially lower-end models) simply don’t have the power and control that German-brand vehicles offer. That’s because German producers generally place an emphasis in quality parts. German auto manufacturers constantly push the envelope on automobile technology, constantly innovating, consistently paving the way for automobile design. That’s why, when you look under the hood of a Beemer or a Porsche, you’ll find parts that you just won’t find anywhere else. So, while Japanese vehicles soak up about 35 percent of the American market, German autos drive the high-end market. Japanese brands are synonymous with affordability; German brands are synonymous with luxury and power. Germany has long led the automobile industry in innovation. Take BMW®. Founded in 1916, this automobile icon was formed after World War I when its original corporation, Aerowerke Gustav Otto, an airplane manufacturing company, was forced to shut down due to its involvement in the war. That company, whose engines were notoriously powerful for German warplanes, continued their legacy with their automobiles under the BMW name. Over the years BMW pioneered numerous aviation and automotive technologies, providing some of the best vehicles and engines on the market. And that theme carries over to other manufacturers, like Volkswagen®, Porsche®, and Audi®. Thus, German brands are famously tied to an image of power, as well as luxury. If you live here in the Denver area, we provide repair and maintenance for German automobiles. We service German vehicles, including autos built by Audi, BMW, Volkswagen, Porsche, and Mini®. Find out for yourself why we’re Denver’s best German auto repair shop! Schedule an appointment today!